in attach you find a scan of the last page of a software manual made by Stratford Computer Center (software is dated 1984). Can someone help me to translate and find if all software is already listed into Generation-MSX? So, I decided to have a preliminary look into this. First of all, I don't understand Japanese in any way or form. Translations are from Google. The page is from April 1984, so quite early. As such it does not include later released titles. 12) 楽しい算数 2年・下 - Fun Math and Arithmetic for Year 2 and below ?? 13) 楽しい算数 3年・下 - Fun Math and Arithmetic for Year 3 and below ?? 14) 楽しい算数 4年・下 - Fun Math and Arithmetic for Year 4 and below ?? 15) 楽しい算数 5年・下 - Fun Math and Arithmetic for Year 5 and below ?? 16) 楽しい算数 6年・下 - Fun Math and Arithmetic for Year 6 and below ?? thankyou this is a good step forward. Ok, so I have done a bit of work on the DB. I updated existing entries 17,19,23,24 and 25 with any new data I found. I left the name "Golden Grave" instead of the (to myself better sounding) translation of "Golden Tomb", as the sequel to it is actually named "Golden Grave II" on the box. For entries 1,2 and 3. First of all, I used "Junior High" instead of "Secondary School" as that seems to be the more common translation. I changed the name of entry 1 to be year 1 and created new entries for years 2 and 3. This prevents that I break any external links to it. I also found some more images that I added to the entries. For entry 4,5 and 6 I did the same thing. Then I get to all the math entries. I have not yet started them. As to entry 18: 幼児の英語 (Infant English) I get a bit confused. There is another entry in the DB for 幼児のえいご (Small Child English). I checked Tagoo and there is no entry for 幼児の英語. And doing a google search for 幼児の英語 gives only some results for 幼児のえいご instead. 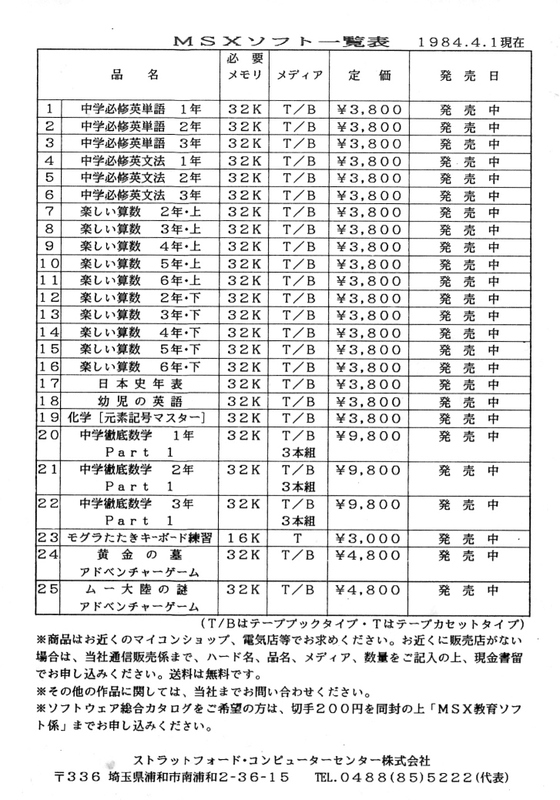 In addition the 幼児のえいご DB entry is from 1983/1984 so I would expect it to have been on the list. So I am suspecting they are the same thing. But even after this, there are lots of other Stratford C.C. entries that seem to need a similar cleanup. But without a newer version of such a list it is not easy. Edited 1 time(s). Last edit at 11/09/2016 12:25PM by rderooy. I created entries for 20, 21 and 22 out of the single existing entry. While searching for more product images I found some for "Part 2" of the series, including a detailed image of the back of the box with all six listed. So in addition to the three "Part 1" entries, I also created three "Part 2" entries. Now the "Fun Math and Arithmetic" series... If somebody can give me a better translation for 楽しい算数 2年・下 which google translates as something like "Fun Math and Arithmetic for Year 2 and below" which seems like a really weird title it would be helpful. So I have created entries for all the Math software titles. I decided to name 楽しい算数 2年・下 as "Fun Math and Arithmetic up to Year 2" is it correct? Who knows. It seemed better then "year 2 or down" or "year 2 or below" which where suggested by Google. Looking over the remaining Stratford titles there are some others that could do with some cleaning up. First of all, I did not create a entry for 幼児の英語. I suspect it is the same as 幼児のえいご. And then there is the strange entry for "Magical Zoo". Magical Zoo happens to be the name of a software house that Stratford worked with on some of the adventure games. The only thing the entry contains are some vague images and a Sony product code which Google only is able to find on the gen-msx website and on a website from Manuel with a cartridge list, but without further details. As such I suspect it is actually the Sony product code for some other software release. In fact, On the back of "Fun Math and Arithmetic for Year 4 and up" you can see both a Stratford and Sony product code. Only in that case it is a HBJ-E code which I think means Educational compared to this HBJ-G code which probably stands for Game. And in fact when I look at a Magical Zoo game called "Tomb of the Golden", I find one of the screenshots from this "Magical Zoo" software entry. Edited 1 time(s). Last edit at 11/09/2016 02:30PM by rderooy. Good points, perhaps this helps. I guess it's just Golden Grave again, made by Stratford CC. The screenshots I added also come from the Computer Software World catalog of Sony MSX software. I wouldn't be surprised if all that "Tomb of the Golden" and "Golden Grave" stuff is just all of the same. And yes, perhaps Sony also published Golden Grave under HBJ-G040D. I'm pretty sure I saw once a scan of Computer Software World where "Magical Zoo" was mentioned, as well as Stratford CC. So I'm not sure what it is again, and I can't seem to find it back easily. Well the entry for "Tomb of the Golden" has as Japanese name 黄金の墓 which also happens to be the Japanese name for Golden Grave. So unless there are two games with the same title, it is probably all the same game. I have merged the "Tomb of the Golden" and "Magical Zoo" releases into the "Golden Grave" entry and cleaned things up a bit. I was expecting this to just be twice the same game when I started them. But I got not just two different opening sequences, but the adventure starts in a totally different location. Unfortunately I have no idea how to navigate a Japanese text adventure so I get stuck at the first screen. All I found is that when entering W, M or P it will tell you how much Water, Money or Power you have left (trying this on the tape version just gives an error). Regarding the tosec naming, the "Ougon no Haka" part translates to Abomination, and this is also shown as a tape loading screen. The tape version also has a screen with the Japanese 黄金の墓 title, so that makes me feel confident that it is the actual Golden Grave game. No idea why it shows "Ougon no Haka" on the loading screen. So the question is, what is the disk version. The images don't match with what we have in the DB for the only other two Magical Zoo releases, Golden Grave II or Mystery of the Mu Continent either. And I don't have either of those games so cannot check them myself either. I also checked msxgamesworld and they have Golden grave 1 and 2 (which for some reason only starts in openmsx when I select a TurboR). The Golden Grave 1 version matches the tape version, and the Golden Grave 2 is indeed Golden Grave 2 as it says so on the intro screen when I start it. Ok, so the disk version is also called 黄金の墓 just like the tape version. One of the opening screens has the Kanji title on it (missed it initially). So we seem to have two different text adventure games from the same publisher with the same title. Perhaps the tape version is a stripped down version of the disk version? What we know is that they released the original game on tape in 1984. What I suspect is that they at some later point they decided to "refresh" the game with new graphics. 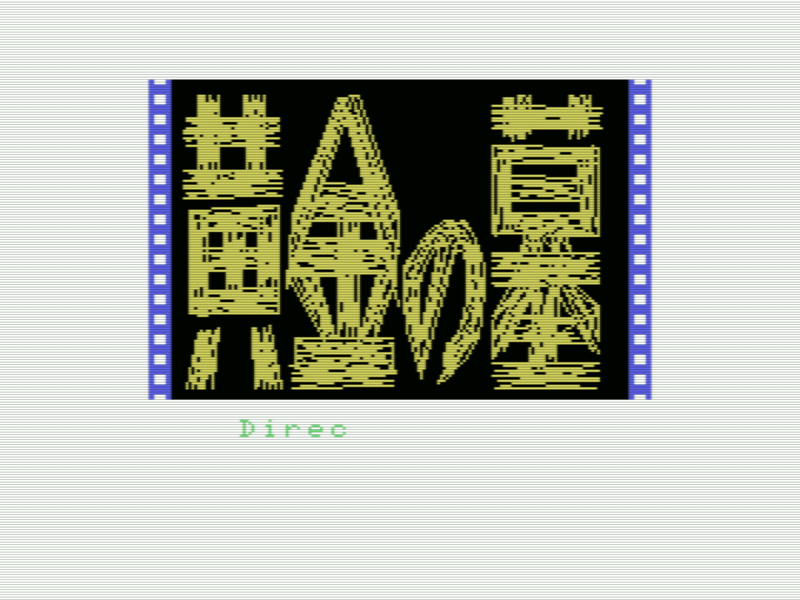 The disk version graphics are more "artistic" compared to the tape version. Problem is, which releases are which now. Looking at the box of the only disk release we have in the DB, the back of the box with the screenshots looks identical to the tape release. So perhaps there are even two different disk releases. Maybe it is the Sony disk release that has the refreshed graphics and different starting point. All speculation obviously... and since I cannot play a Japanese text adventure I cannot say if the game is actually the same. The Sony releases are usually almost identical to the orginal ones. They usually just put a sticker with the code on it, but not much more. So I doubt the Sony release is related to improved graphics. For the screenshots on the back, it could be that they improved the game, but reused the cover art. The cover is probably quite expensive to change if you still have enough of them on stock. Best assumption so far would be (until proven otherwise) that the disk version has enhanced graphics over the tape version, but has the same box. That was more or less my thought also. I could just add some screenshots from the tosec disk version, to the disk version entry in the DB and be done with it.